The UK Government has made ongoing commitments to reduce emissions such as carbon dioxide, which is harmful to the environment. Almost half of the carbon dioxide emissions in the UK are generated by the energy used to heat, light and cool our buildings. Energy efficient windows help to contain heat and use natural “free” energy to light and heat your home. Here’s how you can judge which windows will reduce emissions and reduce your fuel bills the most. This is a scale designed to measure the thermal performance of windows. 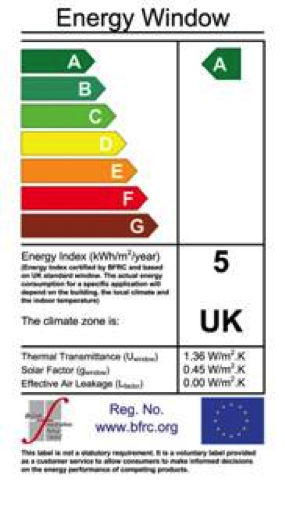 The Window Energy Ratings (WER) scale runs from A to G, with A being awarded to the most energy efficient windows. The WER take into account the U-value, g-value and the air leakage rate of the all the components of the fitted window. U-value: represents the amount of heat the window loses to the outside – the lower the U-value the better thermal performance. g-value: measures how much light passes through the window – the higher the g-value the more free light/heat energy can be gained from the sun. Air leakage rate : shows the amount of air that can escape through the seals. Therefore the overall performance of the window is dependent on the combined efficiency of the frame, the double glazed unit’s components and the air tightness of the finished windows. The purpose of WER is to allow one window’s energy performance to be directly compared to another – the better performance the greater the savings on your fuel bill.